The total rebuilding of Mansfield House has undoubtedly been the most significant of recent projects, having caused the temporary relocation of hundreds of students since last year. According to the school, Mansfield students will finally have a permanent building to call home by late Term 2. Both Mansfield House and the covered walkways around school are being rebuilt as the 20-plus-year-old structures suffer from ‘leaky building syndrome’ — a condition that has plagued almost every building within the school and been the primary target of the multimillion-dollar government-funded rebuild over the past 10 years. Faulty contractors originally hired by the Ministry of Education in the 1990’s have been widely blamed for the ‘leaky building syndrome’ with issues appearing at hundreds of schools nationwide. 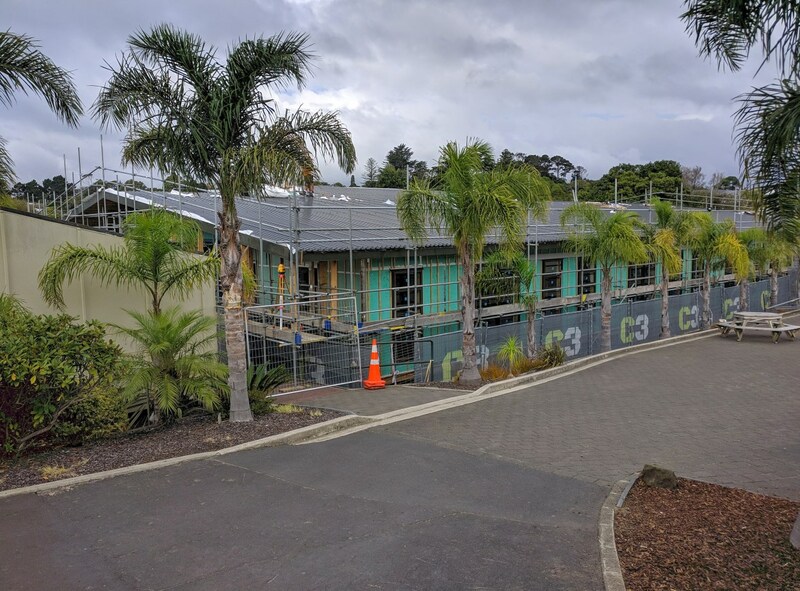 The walkway rebuild is expected to be finished by October; in the meantime, movement around Hillary and Te Kanawa House has been severely affected for students and staff. Mr Peek says that strict health and safety regulations dictate that the construction sites must be fenced off. Therefore, students and staff at times are unable to access buildings through their normal routes. These structures house a number of services such as power, internet, gas, fire, security and heating which are crucial to the smooth running of the school. According to Mr Peek, the services have been upgraded and should be more reliable for staff and students once the rebuild is finished. Thankfully, during periods of heavy rainfall, the walkways will no longer leak. After Mansfield’s completion, “the plan is that X Block will be removed”; with the other small Mansfield offshoot classes M11 and M12 apparently to be removed at a later date. The long-awaited rebuild has been delayed for two years, with demolition originally scheduled to start in 2016. Mr Peek says the delays in the process have been due to long waits from Auckland Council to issue building consents and for the arrival of building materials. Many students will also notice a new pavilion next to the upper sports fields. It will provide a space for teams and spectators to gather after matches and for special events to be held. According to Mr Peek, the pavilion lounge with panoramic windows provides a spectacular view of the sports areas from both the sundeck and from inside. The school says the pavilion will open in May. The sports pavilion is also adjacent to a new changing room and toilet facility that can be used for PE classes and sports. These turf projects have not been funded by the government but instead by the school, with funding provisioned by the Board. However, the final and perhaps the most disrupting phase of the school’s rebuilds is still yet to come. That’s because the Technology, Science, and Home Economics Block are all due to be replaced in the upcoming years. The three blocks are being replaced by one combined building with a commons-type area and classrooms. The endeavour is intended to be completed in stages in order to ensure as little disruption as possible to the running of the school; work is planned to commence at the end of the year. Following this, the auditorium and main administration block are also due for a rebuild. These planned works may seem slightly excessive in combination with the construction already underway around school, but these persistent disruptions are not without reason, as these blocks too have been affected by ‘leaky building syndrome’. The Ministry of Education still estimates 1000 school buildings across New Zealand are in need of repairing due to ‘leaky building syndrome’.